Paris – The property’s extensive renovation and redecoration was personally overseen by its owners and top managers who carefully selected each item of furniture, paintings and lithographs from the Napoleonic period/19th century. 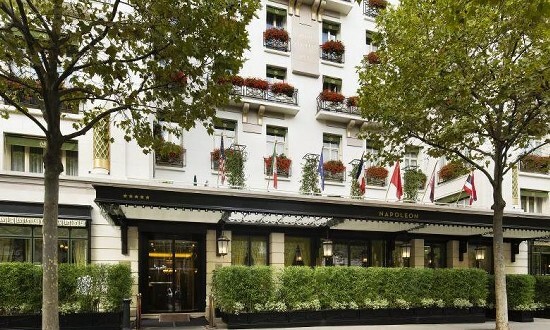 There are even documents bearing the Emperor’s signature Today Hotel Napoleon Paris, is known as a haven of charm and elegance, ideal for tourists and businessmen. Under the auspices of its General Manager, Mr. Ludovic Corpechot, the hotel has taken on a new look. The design of the interiors has been revamped; rooms redecorated, the hotel has invested significantly in updating its technology. Half of the hotel’s rooms face Avenue de Friedland and rooms on the top roof have breathtaking views of Arc de Triomphe and the Eiffel Tower. First floor suites have private terraces. The other half of the rooms overlooks a lush and intimate interior courtyard and atrium. Situated in the middle of the “Golden Triangle” of Paris, the Hotel Napoleon has direct access to the business district as well as tourist monuments, fashion houses and luxury boutiques, and museums. Hotel Napoleon Paris is one of the last fully independent hotels in Paris. This entry was posted in Arts / LifeStyle / Travel and tagged Hotel Napoleon, Paris. Bookmark the permalink.